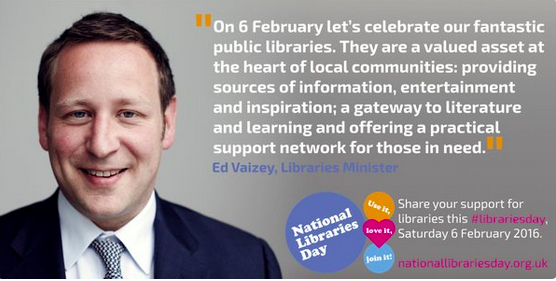 In case you didn’t notice, Saturday 6 February was National Libraries Day! This annual celebration of libraries and library staff is co-ordinated by CILIP (the Chartered Institute of Library and Information Professionals). Libraries up and down the country ran activities and events, with some of the highlights being shown on the map on the National Libraries Day website: http://www.nationallibrariesday.org.uk/. The Taskforce team all visited a range of libraries, and other members of the Libraries Taskforce shared what they and their organisations were doing. We’ve picked out some of the highlights below, plus we’ve rounded up the whole day in a storify. Photos are collected in our flickr album. Kathy’s visit to Wimbledon library was previewed in the Bookseller. She tweeted about her visit, including on meeting author OA Clement and touring Wimbletech, whose base in the library is a flourishing home for start-up businesses. Anna accompanied Baroness Neville-Rolfe to Northcote library, where the latter met members of the library team and read a story to a group of children. 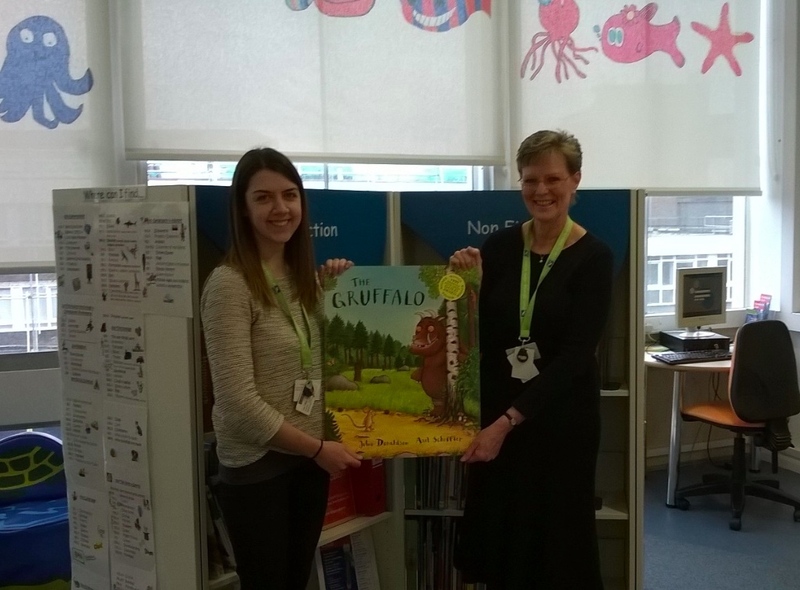 Sue and Sharon experienced the mass reading of the Gruffalo that took place in libraries across the Libraries West Region, and met local MPs, councillors and lots of local residents. And me? I completed my mission to visit all Medway libraries, by visiting the remaining 4. 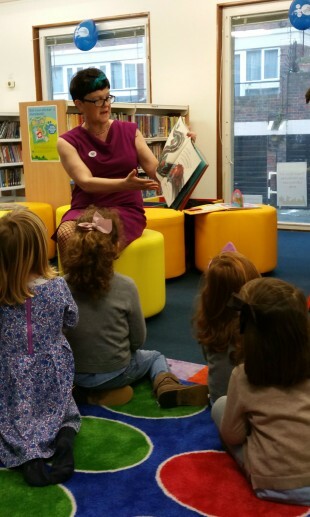 You can read about my day in my blog, or see photos of all Medway libraries I've visited. Culture Minister Ed Vaizey visited Askew Road library in Hammersmith and Fulham. He was also very active on social media, particularly highlighting the supportive comments made by MPs around the country as they took part in events or tweeted their support. 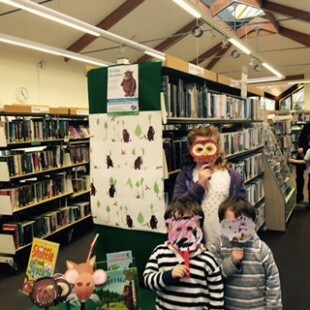 Taskforce chair, Paul Blantern, was at his local library in Thrapston, where he was joined by the Bookstart bear! Simon Richardson, libraries lead for DCMS, did a tour of London libraries including many in Hackney, Haringey and Enfield. He has shared lots of notes with the team (fuel for a future blog post perhaps) and took part in the activities that were on offer. Darren Henley, Arts Council England chair, was in Manchester Central Library and Liverpool Central Library and penned this blog on the ACE #Libraryletters project. 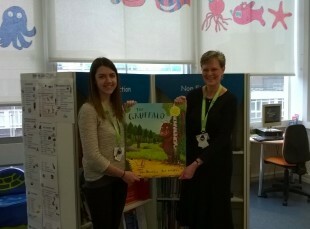 Ciara Eastell, President of the Society of Chief Librarians and Chief Executive of Libraries Unlimited in Devon, went to @Hayridge and @ExeterLibrary for free family fun, and thanked “ALL @DevonLibraries staff for their hard work welcoming library users to our 50 libraries, 4 mobiles & 3 prison libs”. Sue Wilkinson, Chief Executive of the Reading Agency, blogged about why we all need libraries. And Roly Keating, Chief Executive of the British Library, tweeted “Happy #NationalLibrariesDay from all of us at @britishlibrary" and reminded us that "Creativity needs constant nourishment, and libraries are at the heart of that". It’s impossible to do justice here to the wide range of activities - from searching for golden tickets in books in Plymouth to mass storytellings, author readings and exhibitions, via miles of bunting, balloons and flags. 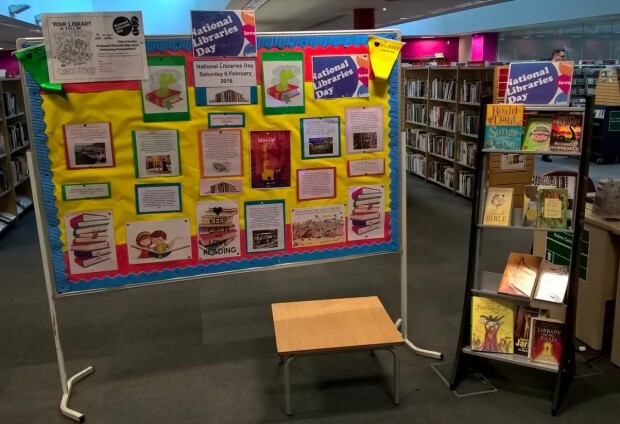 Libraries West have prepared a storify of events in their region, whilst CILIP in Kent prepared a gallery of messages from staff and a map showing ALL libraries in Kent. Any other other library regions who have prepared overviews, please do add links to your stories in the comments below. 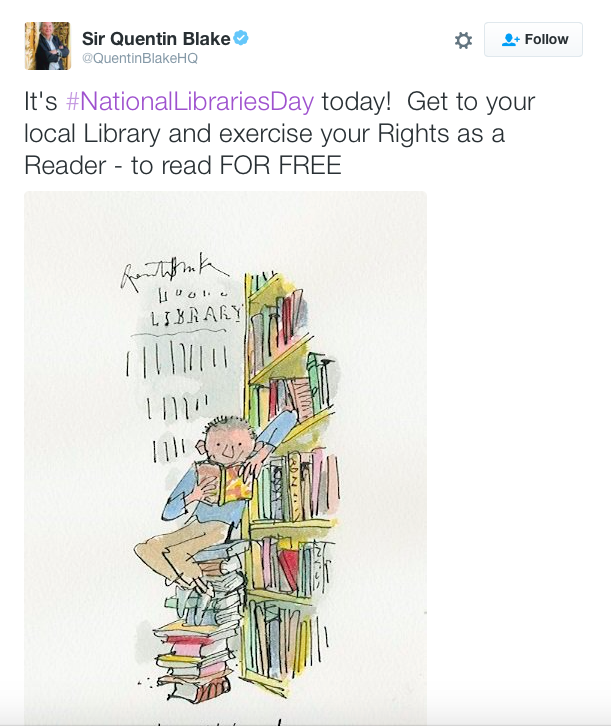 You can see more links on our Libraries Taskforce storify, and by searching #LibrariesDay or #NationalLibrariesDay. and finally, the British Film Institute, who prepared a list of librarians in films. Who can forget the time when a slightly unsteady Rachel Weisz got to her feet and delared “I am proud of what I am – I am a librarian!” (shortly after she had destroyed her library by, as the BFI puts it, an unintentional game of bookshelf dominoes...). 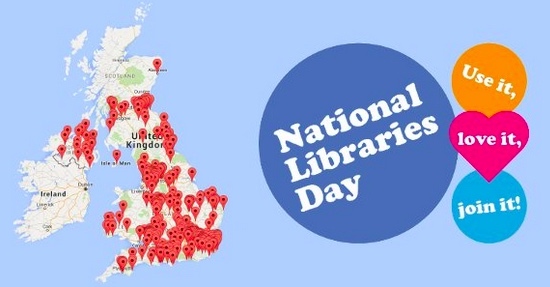 I’ll leave the final summing up to the author Anne Cleeves, Ambassador for National Libraries Day 2016; “Not only do libraries encourage us to be more tolerant and better informed, they contribute enormously to the wealth of the nation”.